Zhejiang Dali Technology Co, Itd.is a Thermal imager,Infrared camerain one large multi-functional integrated modern enterprise,and devote the high-quality Night Visionx2263ff6n and first-class service for the masses of customers. Zhejiang Dali Technology Co, Itd. is specialized in Industry and agriculture,Instrumentation,Instrumentation supply since established in 10 years ago.So far,our company has established its branch companies in major cities throughout the country.Formed in 639 Binkang Road, Hangzhou P.R.CHINA,Binjiang District,Hangzhou City,Zhejiang Province,China as the center, the radiation sales system and service network.Details:DM60-W has the characteristics of non-contact fast, convenient, intuitive, and safe, which overcomes the deficiencies of traditional thermometers, forehead thermometers, spot thermometers, and ear thermometers, etc., which are only for individual measurement, time-consuming and easy to cross-infect. It can effectively control the spread of the epidemic and reduce the number of casualties. 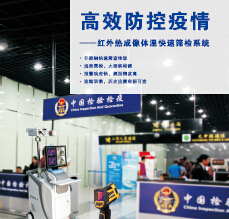 It is very suitable for rapid examination of body temperature in places where people, such as airports, docks, stations, hospitals, and shopping malls have large traffic.System functions:Full screen temperature measurementReal-time automatic tracking of the highest temperature, multi-target over-temperature simultaneous alarm.Various pseudo-color palettesUsers can adjust different colors according to their needs.Body temperature smart measurementWhen the workstation alarms, it can save alarm images or real-time videos, and can perform post-inquiries, analysis records, video file full tips; temperature emissivity, distance, ambient temperature and relative humidity can be adjusted and body surface temperature automatic correction function.Infrared and visible light image temperature superpositionInfrared thermography and visible light field angles are basically the same, and can accurately locate and superimpose temperature analysis results on infrared and visible light images.Remote temperature image uploadThe on-site image can be connected to the back-end information center through Telecom Global Eye or other TCP/IP network protocols for real-time browsing of site monitoring.Smart alarm functionCan set the alarm temperature range, alarm minimum area and other alarm combination conditions, to achieve multiple alarm and tracking, to ensure that no missed detection; to avoid cigarette butts, hot water and other high-temperature objects of interference;Multiple temperature alarms can be set and multiple alarm zones can be set;Effectively avoid light boxes, lamps and other interference;Can set temperature alarm delay, set temperature point and alarm sensitivity;The alarm temperature value display can be set and displayed in different eye-catching colors, and an audible and visual alarm signal can be issued to trigger the voice alarm function.